With Agents of S.H.I.E.L.D. on its State-side mid-season break, Marvel’s second network television series returns to fill the gap. Since Agent Peggy Carter’s introduction in Marvel Studios’ Captain America: The First Avenger (2011), actress Hayley Atwell has been able to forge a likeable and important screen presence with numerous subsequent appearances in episodes of Marvel’s first small screen spin-off, Agents of S.H.I.E.L.D. (courtesy of flashback sequences) as well as big screen hits Captain America: The Winter Soldier (2014) and Ant-Man (2015) helping to develop connective strands woven through the Marvel Cinematic Universe. Given the overwhelmingly positive reception of the Agent Carter ‘Marvel One Shot’ short included in the Iron Man Three blu-ray release it was no surprise that Atwell would subsequently land her own series. Over its eight episodes the first season of Marvel’s Agent Carter proved to be a successful mix that was thrilling, fun and funny. The season 2 premiere (which aired together with episode 2 in the U.S.) sees Peggy transferred to the newly established L.A. division of the SSR by disgruntled Chief Jack Thompson (Murray), not wanting to be outshone by Carter whose struggles to prove her worth as a skilled and competent agent in a male dominated environment were explored last season. The breaking point for Thompson comes when Carter aides in the capture and interrogation of Black Widow assassin Dottie Underwood (seemingly tying up lose threads from last season? That may not be the case?). These chain of events allow for an action packed opening and for Atwell to stretch her acting chops in some well-played scenes between Carter, Underwood (a returning Bridget Regan once again providing the right level of cool and unhinged femme fatale villainy) and Thompson. Gladly, Carter arrives in L.A. to be reunited with Howard Stark’s faithful (albeit suffering) butler Edwin Jarvis, bringing back together the exceptional team of Hayley Atwell and James D’Arcy that was a one of season 1’s most successful elements. D’Arcy is pitch perfect in the role of Jarvis and deftly infuses the character with doses of British stiff upper lip as he bemoans of the glitz and glam of the Hollywood lifestyle and the obsessions and demands of his master. Dominic Cooper’s Howard Stark may himself be absent from this episode but his presence is certainly felt as Jarvis grapples with the latest addition to Stark’s menagerie…a pink flamingo that refuses to co-operate! There’s some unease when Carter confronts her new chief, Daniel Sousa (Dollhouse’s Enver Gjovak) given hints of a blossoming romance at the end of last season but both soon re-establish their camaraderie as the SSR investigates the corpse of a mysterious women, frozen in a lake (during an L.A. heatwave no-less) and how it may tie to actress Whitney Frost (Wynn Everett), the LAPD and a radioactive isotope being manufactured by shady corporation Isodyne Energy. The move to L.A. provides the series with a fresh start that’s welcoming to new viewers and once again the recreation of post-War 1940s is well-presented via costume and production design (aided by the peppering of some period stock footage). Brant Englestein’s script serves well as a reintroduction to the main characters and a taster for this season’s storyline along with some neat twists (and a surprising connection to Agents of S.H.I.E.L.D.) and the odd easter egg for die hard Marvel Comics fans. The bottom line: Peggy Carter is back in a fun and tantalising opening for Agent Carter’s second season. 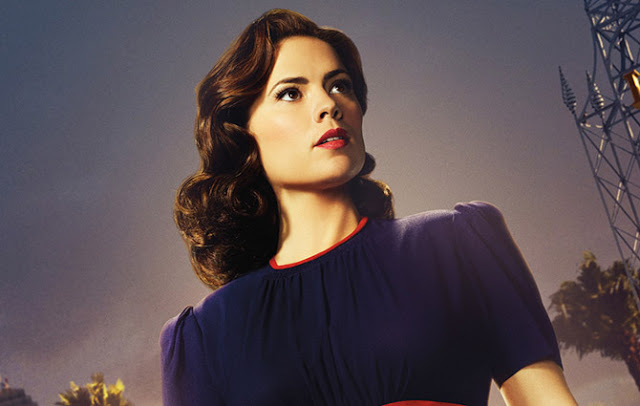 Marvel’s Agent Carter airs in the UK Thursday evenings on Fox. U.S. viewers can catch it on ABC. What did you think of the ‘Agent Carter’ season premiere? Share your thoughts below! Hayley Atwell returns as Peggy Carter in Marvel’s ‘Agent Carter’.